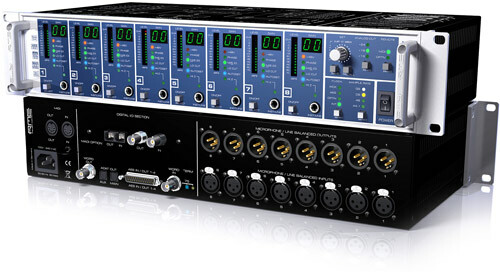 RME Micstasy - is an 8-Channel hi-end mic/line preamp and AD-converter combining typical RME features with a number of previously unseen features. It can be used analog (Mic/Line In to Line Out) and digital (Mic/Line In to Digital Out), with both signal paths operating simultaneously. Special highlight: the device is fully remote-controllable via MIDI (also MIDI over MADI). In a standard 19" box with 2 unit height the device offers numerous extraordinary features like Intelligent Clock Control (ICC)	, SyncCheck	®, SteadyClock, TotalGain, AutoSet, MIDI over MADI, and remote control via MADI and MIDI.